One of the questions I get asked a lot is if I live a 100% raw, vegan lifestyle, and my answer is no. I don’t claim to be 100% anything in my food choices. I love using a pure raw, vegan program for detoxification, and I advocate a lifestyle that includes a high proportion of raw foods, however I don’t have an issue with small amounts of ethically produced and humane animal products as a part of an ongoing healthy lifestyle. Everyone has to draw their own line when it comes to this choice, and it can be a very emotional and multi-faceted issue. One of the most important things that people can do, is to genuinely look into the choices they make in their food, and understand exactly where their food comes from, and what their dollars are supporting when they make those choices. Watching documentaries such as Earthlings, I believe should be mandatory for every person on the planet, and responsiblity taken for their choices. I personally don’t have an issue with eating healthy, organic, good quality eggs – preferably from backyard hens that are loved and nurtured. That would be my first choice if you are going to include some eggs into your diet. The second choice would be free-range – although there are dubious ethics when we talk about any industrial enterprise. One of the things that I would love to see though, is the absolute banning of caged-hens and battery farming with a change to only free-range being available. Of course, this is not the “end answer” as we still have problems with that, such as the gender selection of chickens coming into play, and layers being “processed” – often not humanely – at the end of their laying life. But it would be a step in a better direction for egg production in Australia. When my step-son and I were internet searching about battery hens, it reminded me of being a young animal-rights activist when I was a teenager. I had become a vegetarian at a young age, and in my emotional, teenage self-righteousness, planned to turn everyone on the planet into a vegetarian. I wrote passionate letters about animal rights to every magazine and newspaper, I joined every animal liberation organisation, I preached to everyone I knew, and even did some illegal missions whereby a group of friends and I raided a battery hen factory, opening cages and stealing chickens for rehabilition. I don’t think we made that much of an impact, other than annoying the chicken farmer and saving those few hens from a life of misery – but we were passionate crusaders, fighting the good fight. When I look back now – and that was over 25 years ago – I’m sorry to see that not much has changed in that time. Battery hens – one of my big issues – is STILL happening in Australia and I find it hard to believe that a country that has so much space and is such a rich country, is still allowing this cruel practice. Battery hens are not allowed to live a natural life. They are forced into tiny cages where they have very little room to move, they cannot stretch their wings, scratch in the dirt, eat a natural diet, develop a pecking order, dirt bath, or roost. They are fed an unnatural diet including hormones and antibiotics because they are so prone to disesase under these conditions. They are debeaked so that they don’t peck each other to death and pull out all their feathers, they often have wounds on their feet from the caging and are forced to lay much more frequently than nature intended through the use of artificial lighting. These hens are a commodity, a product for the factory-farming food industry and should be banned. Although battery hens have been phased out in Europe, with a ban being established since the start of 2012, Australia is very slow to catch up. 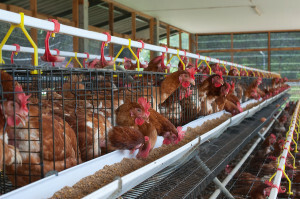 Although lobbying by Animals Australia has started to make an impact: “For the 12 million hens still confined in battery cages in Australia hope is finally in sight. The recent announcement by Woolworths that it would reduce its product lines of caged eggs represents the first shift by a major retailer away from supporting factory-farmed products, and importantly, reflects growing consumer awareness of the lives endured by hens in battery cages… Whilst the battery cage has been banned in the EU since the start of 2012, no phase out date has been forecast for Australia. With political reviews failing to provide welfare advances for animals, Animals Australia’s focus changed to lobbying retailers and educating consumers to use their purchasing power to demand an end to cruel practices. Last year members of Animals Australia’s Action Network wrote to Woolworths expressing their concerns about how hens and pigs were treated. Woolworths advised us that in response to letters received, they had established an animal welfare committee to review their livestock supplier standards – another great win for the Action Network! Both Animals Australia and Animal Liberation NSW have presented evidence of the suffering endured by factory farmed animals to this committee; and called on Woolworths to improve their standards and phase out their lines of factory farmed products. This subsequent decision by Woolworths to reduce its lines of caged eggs is welcomed as an important first step that will send a strong signal to caged egg producers that the end is nigh. In further good news, McDonalds announced that it would be moving its Australian operation to only using free-range eggs. Our meetings with both Woolworths and McDonalds have revealed the growing significance that retailers are giving to meeting and addressing animal welfare concerns. In the UK welfare reforms have been led by retailers. Two of Britain’s biggest supermarkets no longer stock caged eggs and McDonalds, Subway and Starbucks in the UK use only free-range eggs. Although choosing free-range at the supermarket is a step in the right direction, one of the more powerful choices that you could make with your dollar is to support farmers who ONLY produce free-range eggs. By purchasing Sunny Queen or Meggles free-range eggs, your money is still going back to that company, and the majority of their egg production is factory-farmed. So you are increasing their profits with your dollar and inadvertantly supporting battery hens. Instead of buying supermarket eggs at all, go to your local farmers market and talk to some of the farmers there about their eggs. Find out their story, how they are raised, how they gender select, how they treat their hens and how they deal with them at the end of their laying life. These are important questions and only through finding out the answers, can you be assured of eating a minimal-harm product. 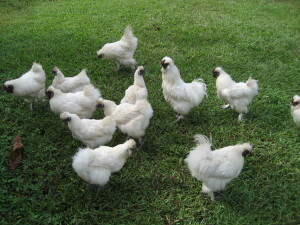 What are your thoughts about battery hens? Do you eat eggs at all, or prefer a totally vegan lifestyle? 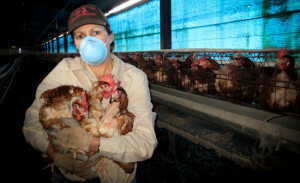 Have you thought much about the ethics of egg prodution? Leisa, that is too funny! I can imagine you with a balaklava on, breaking into a chicken farm and stealing chickens – that’s hilarious! What isn’t funny though is exactly this issue, battery hen farming has to stop. Its cruel and disgusting and I can’t believe people still buy these eggs. Enough people! Wake the hell up! Previous post: Making It Easy To Be Raw! Next post: Does Your Body Need A Spring Clean?